Chiang Mai, Thailand wears a golden smile. Fern green mountains crest her head. Long boats glide in streaks of red. Elephants trek in shades of brown. Temples wear a yellow crown. Lanterns cast an orange glow. Sunsets melt to indigo. Skies are dressed in cobalt blue. Rainbows ride hot air balloons. Markets throb with brilliant hues. Spices pop in curried stews. THE COLOURS OF CHIANG MAI. Enjoy a sweeping view of Chiang Mai from the sky in a hot air balloon. Your tour begins at 6am with transport from our hotel to the launch site. While the crew prepares the balloon, you’ll enjoy a welcome snack and beverage. The flight begins with the blessing of a Chiang Mai sunrise. You’ll float above the countryside, over rice paddies, gardens, farmland, temples, and villages. At 8am, a delicious buffet breakfast is served. The balloon ride lasts approximately 1.5 hours. It concludes with a champagne celebration and receipt of a certificate commemorating your flight. All tours are conducted by licensed pilots. Your safety is assured. Balloons are registered and inspected by the Thai Aviation Authorities. Each flight is under the control of the Chiang Mai Airport Tower. The Colors of Chiang Mai is a 4-5 hour bicycle tour through the southern section of Chiang Mai. The bike route meanders along the Ping River and over quiet roads. Visits are made to a local temple, monk school, rehab facility, pottery, and elementary school attended by hill tribe children. There’s a stop at a bakery for a sweet bun and view of the bakers at work. A trip to a local market includes a sampling of exotic fruits and Thai snacks. Midway through the tour, bikers enjoy a small meal at a local restaurant. Stops are made every hour for a brief rest and beverage. Group size is small, limited to eight people. The tour is led by a professional, licensed, English-speaking guide. 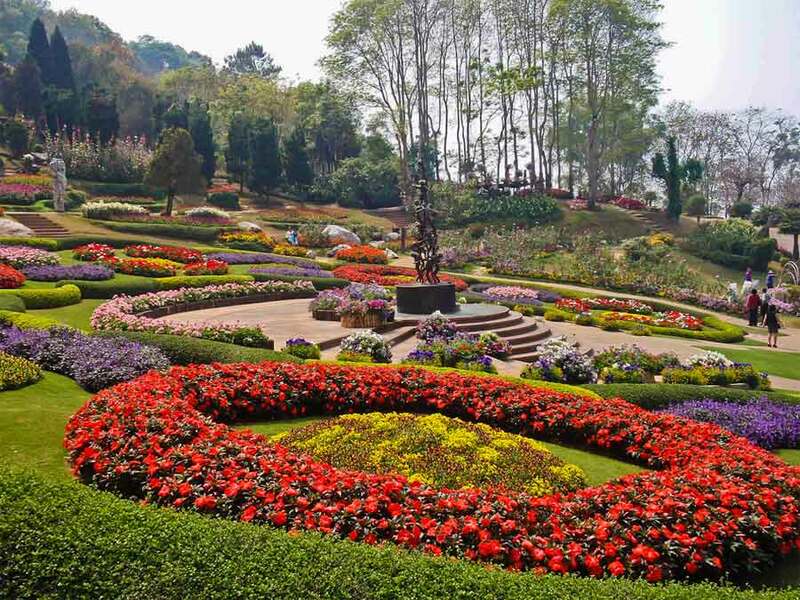 This spectacular botanic garden climbs the Chiang Mai hillside, encompassing streams, trails, and greenhouses. The Ornamental Garden displays colourful flower beds and trees native to other countries. The Fern Garden features moss, plants, and ferns in every shade of green. Banana Avenue showcases over 200 varieties of towering banana trees. Greenhouses are dedicated to specific plant species, including orchids, bromeliads, water lilies, cacti, and succulents. Other plant types cultivated are aquatic, carnivorous, tropical, medicinal, and variegated. An open-air bus provides transportation throughout the garden. The grounds also house a café and gift shop. Experience the colours and flavours of Chiang Mai at a professional cooking school. Basil Cookery School offers two courses, Monday through Saturday. Personalized instruction is given in preparing seven dishes, including noodles, curry, soup, stir-fry, appetizer, dessert, and curry paste. Guests make their selection from 18 dishes. The course includes a visit to a local market for tips on selecting ingredients. Class size is small, limited to seven people. Instructors are skilled, knowledgeable, friendly, and fun. Price includes transport to and from our resort, cooking ingredients, snacks, beverages, and a colour recipe book. The morning course runs from 9am-3pm. The evening course is held from 4pm-8:30pm. The Colour Factory is a retailer of high-quality gift items. It also supports conservation projects protecting elephants as an endangered species. Designer handbags, purses, bracelets, and key rings feature bright colours, tassels, and beading. Bluebird Art Glass is a stunning collection of bowls, dishes, vases, and plates. Ele Music Boxes are handmade of steel in whimsical animal shapes. Unique gift items include card boxes, tea lights, and necklaces. Kaleidoscarves in shimmering silk and vibrant hues are breathtaking! The Colour Factory also sponsors Elephant Parade House, an organization dedicated to the protection of elephants. The 4-story boutique sells elephant statues in a wide range of colours, designs, and sizes. International artists have created over 1,000 life-sized elephant statues, displayed on city streets throughout the world. Once the exhibits end, the statues are auctioned, with partial proceeds donated to The Asian Elephant Foundation. An injured baby elephant is the impetus behind Elephant Parade House. Little “Mosha” lost her right leg after stepping on a land mine. At three years of age, she was fitted with a prosthetic limb. You can view a statue of Mosha near the entrance of the store. Elephant Parade House also holds Art Workshops, where you can paint your own elephant replica. You’re provided with all the paint and brushes needed to transform your blank model into a unique personal memento. If you’re visiting Chiang Mai with children, this is an activity they’re sure to enjoy. Glistening gold in the center of Chiang Mai is Akyra Manor. The inspiration behind our building’s design is the Old City wall. Our interior decor features soft pastels, creating a soothing ambience. Visit our rooftop bar to see the magic of the city lights at night. The colourful cuisine of our Italics restaurant is a feast for the body as well as the eyes. Our golden sanctuary is the ideal location from which to experience the colour wheel of Chiang Mai. Enjoy the charm of Chiang Mai from a hot air balloon, bicycle, botanic garden, cooking school, and an elephant painting workshop. 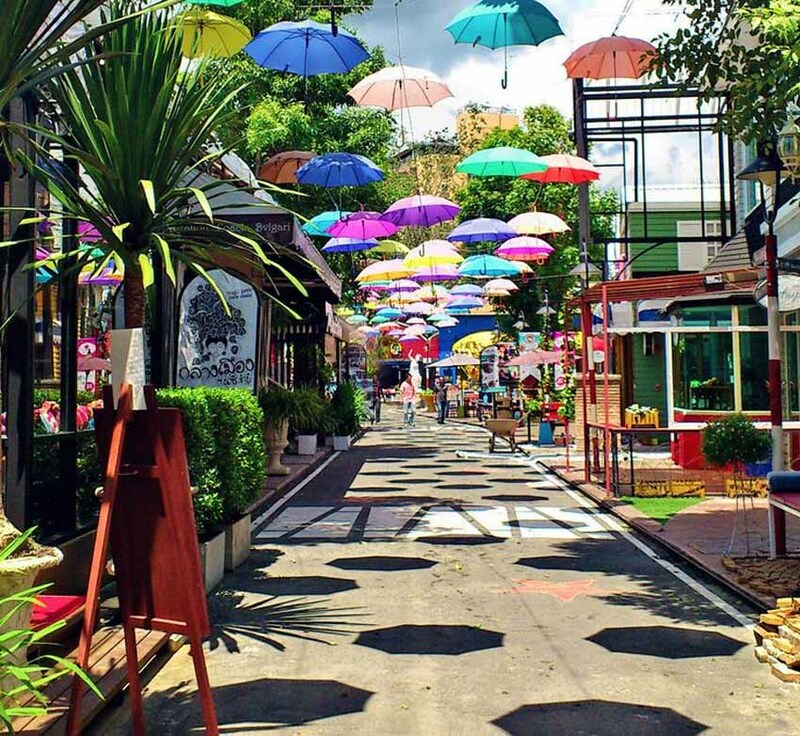 Chiang Mai will give you a rainbow of memories to cherish for a lifetime.